Ruh-roh, I think a court went off the rails. I don’t have a good feeling about this. The case is, in part, about infringement of copyright. As you know, one cannot bring suit for infringement of a U.S. copyright unless the copyright is registered. 17 U.S.C. § 411. But it gets a little confusing with registration of derivative works. In Streetwise, the defendant argued that the registration for the derivative work covered only the new material added to already-existing maps. The court disagreed; in what later came to be called the “effective registration doctrine,” it held that a registration of a derivative work is sufficient for purposes of alleging infringement of the underlying original work also. Although the case has been distinguished by Oravec v. Sunny Isles Luxury Ventures, L.C., 527 F.3d 1218, 1229 (11th Cir. 2008) (holding that the certificate had to identify the preexisting works) and Morris v. Bus. Concepts, Inc., 283 F.3d 502, 505 (2d Cir. 2002) (holding that it only applies to situations where the copyright plaintiff owns both the preexisting and derivative work), it is well-settled law. While this appears logical on its face, it is wrong. The difference in the wording used by AFL Telecommunications is forced by current copyright registration practice and does not mean that the AFL Telecommunications plaintiff intended any different scope of copyright than the Streetwise plaintiff did. 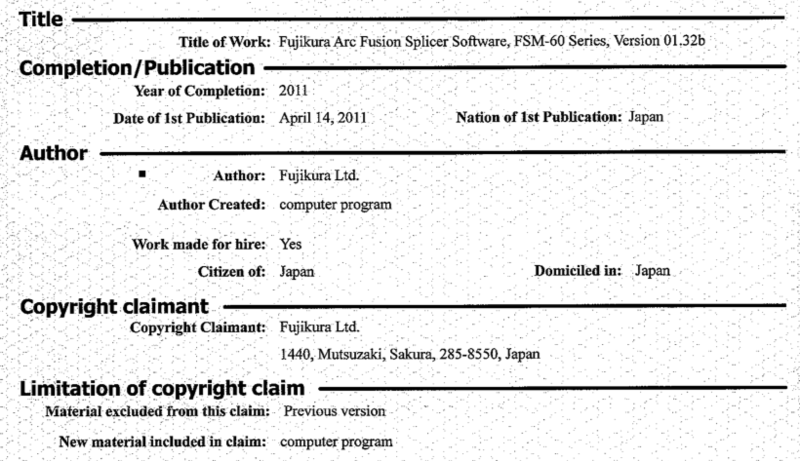 Limitation of Claim· Complete this part of the application if the computer program contains a substantial amount of previously published, registered, or public domain material such as subroutines or modules, or if the work was developed using an underlying computer program or authoring tool. 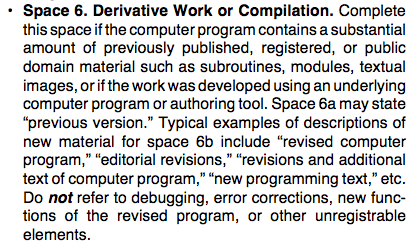 “Material excluded” may state “previous version.” Typical examples of descriptions of “New material included” are “computer program” and “revised version.” Do not refer to debugging, error corrections, new functions of the revised program, or other elements that cannot be registered. Note that this is not discretionary; if a copyright applicant fails to provide the information (because, for example, it wants to claim the underlying work also as part of the registration to satisfy a court like AFL Telecommuncations) the registration may be invalidated as fraudulent. See, e.g., One Treasure’s One Treasure Ltd., Inc. v. Richardson, 202 F. App’x 658, 661 (5th Cir. 2006) (challenging registration for failure to identify derivative sources). So the Copyright Office, by modernizing its system and changing the wording of a block, has led at least one court astray and caused a substantive change to copyright law. But the Copyright Office cannot create substantive copyright law; it only administers it: “The Register of Copyrights is authorized to establish regulations not inconsistent with law.” 17 U.S.C. § 702. The Copyright Office did not have the authority to, and therefore could not have, changed the law merely by changing the words it chose for the content of the application. The court therefore erred in distinguishing this case from Streetwise on the basis of the uneditable form language of the copyright application. The plaintiff’s infringement case failed for other reasons too — it didn’t prove that version 1.32 of the software indeed incorporated earlier versions, or what version of the software was being used on the accused hardware devices. But I have a sinking feeling that Streetwise will be mooted by a small change in a Copyright Office form as plaintiffs find they cannot bring a copyright infringement claim simply because they followed Copyright Office rules. AFL Telecommunications LLC v. SurplusEQ.com Inc., No. CV11-1086 PHX DGC (D. Ariz. May 20, 2013). The copyright in a derivative work extends only to the material contributed by the author of such work, as distinguished from the preexisting material employed in the work, and does not imply any exclusive right in the preexisting material. The copyright in such work is independent of, and does not affect or enlarge the scope, duration, ownership, or subsistence of, any copyright protection in the preexisting material. 17 U.S.C. 103(b). Where a work contains a substantial amount of previously registered, published, or public domain material, the application should contain a statement of the preexisting material as well as the new copyrightable material. Nowhere does Circular 61, however, mention that the preexisting work to be identified is only that of a different author.